photo by Cerdan Designs Art/Entertainment MEDIA I had the privilege to meet Ashkan Tabibnia a couple of years ago, and we got connected with our spiritual path, it was years after that I learned about his successful business side. ized in 5 major brands: Konaki, MD Sound, NT Power, Konaki Digital and Yoshima. 7 Elephants was a featured exhibitor at consumer electronics expos such as Magic, SEMA and the CES shows in Las Vegas. Business was great, but something was missing he said; until one day he realized he wanted to do more. A lifelong dream of his was to develop a social platform where he could share ideas and business strategies with great minds and visionaries, learn additional skills to aid in his personal and business growth, mastermind with other powerful business people and collaborate. And so the birth of Higher Connections Network on February 12, 2009. A core element of his vision was developing an environment where there are NO RULES, NO LIMITATIONS. HCN has helped hundreds of individuals and businesses to find their niche and help to turn their dreams into reality. shows on five stages on 144,000 sq. ft. Among the guests and keynote speakers were Michael Beckwith, Patch Adams, MD., Dannion Brinkley, Frank Shankwitz, Greg Reid, Sharon Lechter, and David Fagan. Ashkan, as humble as he is, always remembers and acknowledges his success from the help of his family and his partners. “ I want to thank my parents who taught me to be who I am, my dad who is 84 years old now, was born blind, but this never stopped him to achieve what he dreamed in his life. He is a master of Philosophy, geology and much more, he never learned Braille. I would like to thank my mother who stood next to my dad through the years, my lovely wife Madlen who is right behind me in the past years. I truly think I couldn’t do it without her, and my three amazing children Ariel, Shaunna and Noah. And last but not least Pia Azores my co-founder, and now president of HCN, who tirelessly and incessantly helped me achieve this great network. 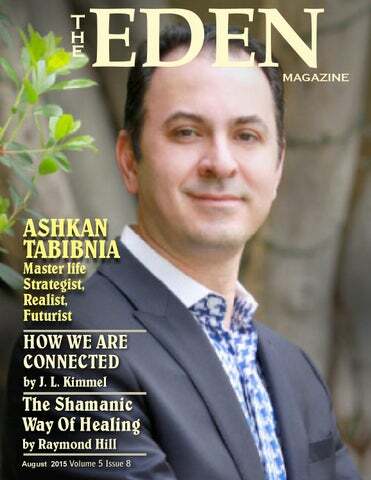 Eden Magazine is proud to announce the collaboration with Ashkan Tabibnia and Higher Connections Network in the future. WE OFFER Higher Living Institute 1. Life Mastery Plan (better known as MLP) 2. Personal Motivation and Inspiration Seminars 3. Creation of a centralized “Personal Universe” 4. Teachings on the five elements that every person has and how to create synergy and balance between them and learn the art of giving: a. Time b. Talent and Skills c. Contacts d. Money e. Resources 5. Contact Management course 6. Ideas of how to create your inner circle to maximize your efficiency and output 7. 12 Steps to a life of mastery (with simplicity, clarity & balance) Higher Experts 1. Exclusive and tailored personal management and PR for personal branding, service, product or business 2. Exclusive referral services Higher Ventures 1. Wold class real estate 2. Financing 3. Project management 4. Investments Higher Xperience 1. How to create and operate social network in the 21st century 2. How to have access to world-class speakers and utilize their expertise and message to impact and influence your community 3. How to create and maintain world-class empowering content and knowledge and how to distribute it into your database 4. How to create a personal organizational master mind group and tools to maintain and deliver at the highest level Higher.org 1. Ideas of how to create the world’s first perfect organization that helps the users by teaching them the best way to create, to grow and to flourish and last but not least to help them understand their life purpose and mission and the best way to utilize their God-given purpose to serve, give and to help the humanity and the world. respectively. As in every process, you are going to need several steps before reaching the goal, and you won’t be able to avoid any of them. There are no elevators that can take you faster and effortlessly to your life purpose. So, if you are truly committed to connect with this calling of yours, a great way to begin is by: 1.Observing all you can from others who have already found theirs. 2.Humbly accepting that you are the only one who can do the work others have already achieved for themselves. 3.Becoming fully devoted to it, because NO OTHER MATTER in life is as important as finding what fuels you with permanent passion and enthusiasm. When I was finding my life purpose and trying to answer the questions: who I am? what I have come here for? I was so confused with my outer reality, – completely identified with the material world – that I didn’t truly believe the answers could be found inside of me, after all, who was I – this little and insignificant human being – to think I had all the answers to my dilemmas, right? For many years, the outer reality kept belittling me and it was just too real to me. At the same time, my inner reality felt so…unreal and even fictional! Roxana Jones and Arnaud Saint-Paul devote themselves to their life purpose: To open as many hearts as possible and to help shifting the consciousness of the planet. As spiritual healers and teachers, life and business partners, their intent is to “help millions around the world to embrace change and start living the type of love, happiness and abundance both of them now know exists for everyone once they are healed.” Together, they work enthusiastically in bringing to their audience the best of themselves so that everyone can connect to their own Truth and unveil who they truly are: divine beings enlightening the world in their own unique ways, even when darkness makes it hard to believe it is so. nize that we are all the same in this way, we can begin to wish happiness for everyone. 2. Recognize a tendency of mind to think more about yourself. Here’s the thing: villains are always trying to get stuff for themselves So what exactly are the causes for superpowers? at the expense of others. Heroes are always And how can we develop them within ourselves to willing to sacrifice themselves to protect even total strangers. As you go about your day, do make the world a better place? you want to be a hero or a villain? Fortunately, superpowers don’t come from radioactive spider bites or laboratory mishaps. Instead, Master Patanjali tells us in The Yoga Sutra that “The powers are found in love and the rest.” He’s referring to the Four Immeasurables: Immeasurable Equanimity, Immeasurable Compassion, Immeasurable Love, and Immeasurable Joy. These attitudes are immeasurable because they are aimed at every living being and because the merit they generate is immeasurable. Indeed, as Patanjali tells us, the merit from these attitudes of heart are so powerful they lead to miraculous abilities. The Buddha first taught the Four Immeasurables around 500 B.C.E. These attitudes were so well known in ancient India during Patanjali’s time that he could simply say “the powers are found in love and the rest” and everyone who was supposed to know, would understand the code. Just watch your mind. Do you spend more time worrying about your own problems and challenges or worrying about someone else’s? Think about these two choices like black and white rocks on an ancient scale. Every time you worry about yourself, stack a black rock on one tray. And every time you think about making someone else happy, stack a white rock. At the end of the day, which way does the balance tip? 3. Watch for what other people want. Now wherever you go, use your eyes, ears, and mind to pay attention to what other people want. Try to stand in their shoes and see how they see the world. Maybe someone just wants So how can you can you develop these attitudes their talents recognized with a little praise. Or in your own heart? One of the most effective ways maybe someone is having a hard time on a is to follow the Buddhist heart-opening practice project and could use an extra hand. Or mayof Exchanging Self and Others. This essential be someone wants a friend to treat them to a practice was taught by the eighth century master nice dinner and listen to their stories. Stay on Shantideva. After giving this teaching, a hall full of the look out for a chance to help like a hero, monks reported Shantideva flew out of the temple without wanting anything in return. into the sky. This practice has four simple steps that you can put into practice immediately in your daily life. 4. Make the exchange. When you see some way to help someone, act. Decide that you will make efforts using whatever skills and abilities 1. Recognize that everyone wants to be hap- you have to help that person get what they py. We are all bliss seekers and pain avoid- want to feel happier (as long as it’s not hurters. Give anyone even the simplest of choices ing someone else, of course). When you are and people will always choose what that they totally focused on ensuring another person’s believe will lead to happiness. Even when happiness, you are transforming a habitual, people act out or act badly it’s because they human tendency to be self-centered--that vilare trying to get something that they believe lain energy--into gaining a supernormal habit will make them happy. When we can recog- to serve other people’s happiness first. Just start small and build up. Anything can become a habit of mind if you keep at it. And we are talking about going from a normal person to a superyogi. A most curious thing happens if you keep this practice up. Watch as you become happier and the people in your world become happier. As Master Shantideva explains in one of the most important teachings ever given: The total amount of happiness That exists in the world has come from Wanting to make others happy. The total amount of suffering That exists in the world has come from Wanting to make yourself happy. So there is a reason that villains never get happy endings. They are only thinking about themselves. If you keep this practice of Exchanging Self and Others going for a while, another curious thing can happen. You’ll get so good at getting your small self out of the way--and serving others as if they were you--that according to ancient Buddhist and Yoga texts, you can begin to be able to read minds. As Master Patanjali explains in The Yoga Sutra, “With the necessary cause, one can read the minds of others.” One fortunate thing about yogic superpowers is that they usually only come to people who can get their small self out of the way and care for everyone. This is why miracles in history are usually performed by saints who are focused on alleviating the suffering of others. True, an occasional villain slips in because powers can be gained and then corrupted, but generally supernormal abilities belong to saints who want to serve others. Let’s just hope you will use your yogic supernormal powers for good. James Connor recently completed an isolated three-year meditation retreat. He is the author of The Superyogi Scenario, a pageturning thriller that allows readers to experience authentic wisdom that creates superheroes. He is also the founder of GoBeyond.org a non-profit that teaches people how to meditate from authentic scriptural sources in the Buddhist and Yoga lineages. For more visit: www.byjamesconnor.com www.gobeyond.org. ing. When we are quiet, we can hear more. In a busy mind, the voice of our inner self is drowned out. Second, by making us less stressed and more positive-minded, it broadens our vision. In contrast, when we are burdened with negative thoughts, our field of vision narrows. True creativity is a whole-brain thing. Ideas that move a poem, a song, or a scientific problem forward often seem to come “out of the blue.” Blue, in this context, means the unconscious mind. One cannot force the unconscious mind, but one can engage with it. The way to engage with it is to always have a question in mind. This is the enquiring mind, the “don’t know mind,” the open mind. This mind often has a childlike quality much prized in Zen. You do not have to be a poet or a scientist to benefit from creativity. Everyday living provides us with plenty of puzzles that can be better solved with a touch of creativity. ● Meditation can help you deal with your own aggressiveness, and to under stand the aggressiveness of sothers. Do you ever wonder why there is so much violence and so many wars in the world? So much bullying, organized crime, and road rage? In Old Path, White Clouds, his interpretive story of Buddha’s life, Thich Nhat Hanh describes Buddha’s awakening as the realization that all his previous lives were in him now—they were not merely past history. The Buddha saw that he was also all those beings in the present moment. Note that what Buddhists call “previous lives” can also be understood as “evolutionary past” in the context of evolutionary psychology. The animal that fights and kills in order to become the alpha male, the cat who kills a songbird just to play with it even though it is not hungry (cats kill three and a half billion songbirds a year), and the lion who attacks a cub just because it is not a member of the same pride, are still in us. The schoolyard bully, the hockey player who knowingly inflicted a concussion on a member of the opposing team, and the bankers who caused the recent financial crisis for personal profit were obeying evolutionary urges. With mindfulness, the past colors the present; it colors our understanding of the present, but it does not dictate our actions. On the contrary, knowing the past can be a warning that without mindfulness, the same urges of our evolutionary ancestors can overwhelm us at any moment. Buddha’s awakening can be an inspiration for psychodynamic psychotherapies as well. Understanding the personal past, the events and the traumas of childhood, brings insight, but in the end, it is mindfulness practice that liberates a person from the grip of the past. The past influences the present mostly through habit. We automatically think or react in a certain way now because of our past conditioning. Without mindfulness, we can just continue thinking the same way, feeling the same way, and blaming it all on past events. Mindfulness makes it possible to make fresh tracks. At first, we gingerly walk on those fresh tracks. With time, the tracks deepen, new and more beneficial habits form, and change becomes a reality. The valuable effects of meditation I described above are progressive. Mindfulness practice begins with observing the breath and calming the mind. It is only by observing these basics and going into them deeply that the additional fruits of meditation are realized. Start there, but do not stop too soon. New vistas open up as you continue practicing. Joseph Emet is the author of Buddha’s Book of Meditation, Buddha’s Book of Stress Reduction, and the award winning Buddha’s Book of Sleep. ( Tarcher Penguin) Available everywhere books are sold. Joseph Emet’s website is http://www.mindfulnessmeditationcentre.org/. I love this quote because so many of us talk and write about being here to have experiences and to learn lessons, but something that we don’t talk about enough is that at the core of every experience is a feeling—and some feelings can be difficult to deal with. It’s the hurt feelings, the feelings of guilt, and the feelings of pain and heartache that affect us the most, don’t you think? Sometimes to the point that we have a hard time recovering from them, which can cause us to waste a lot of time and countless windows of opportunity to do what we came here to do and learn what we came here to learn. When crappy things happen to us, or when tragedy strikes us or a loved one, it is very easy to blame others for our misfortune. As we begin to wake up, one of the most difficult things to wrap our heads around is the understanding that we are the ones who create the situations we find ourselves dealing with—be they happy or sad. We plan nearly everything that happens to us during our lifetimes, just like we choose our immediate family and our friends. And that means that the responsibility for what’s going on in our lives, and how we handle what’s going on in our lives, ultimately belongs to us. There’s no getting around it, and this is one of the reasons why waking up can be hard. It’s unquestionably easier to be asleep, keep our eyes closed to the truth, blame other people for what happens to us, accept whatever “fate” throws our way, and swirl through life like a leaf caught in a whirlpool. sible for planning our lives. And that means making the choice to move from ‘Poor Me’ Avenue over to ‘Take Responsibility’ Court. This is a big move for us, and not an easy one at all, because there’s a lot of stuff we have to throw out as we’re getting ready for this move: Not the least of which are (1) the tendency to blame others for our perceived misfortunes and (2) the propensity to react to crappy situations by spewing negative energy all over the place. of spotting our windows of opportunity as they begin to open or while they’re open rather than after they’ve already closed. Learning to spot windows is like learning any other skill—it just takes practice. •	Step Two is to take the time to master the skill of spotting our windows of opportunity as they begin to open or while they’re open rather than after they’ve already closed. Learning to spot windows is like learning any other skill—it just takes practice. And the best way to start seeing windows in the present is to examine our past and look for the patterns that make up our life scripts. Once we discover a pattern or life script, we can apply that knowledge to what’s going on in our lives right now. Is there a similarity between situations we find ourselves in now and what we’ve been through in the past? If yes, then we’ve discovered a life script and a window. Comparing the present to the past will help us identify windows that are open for us right now. It will also help us recognize the signs of a new window opening early. nize an open window, we can draw on how handled similar situations in the past---and do something different this time. We know that what we’ve done previously didn’t work because we continue to attract parallel circumstances or opportunities into our lives, so we have to find a way to change things up this time: Maybe we change our attitude, maybe the way we react, our behavior—it depends on the situation and what we’ve done to handle it in the past. This is a highly personal plan of action that only we can create for ourselves. If you’re ready to start developing your windowspotting skills, here’s what to do: Set aside even just 10 minutes a day a couple of times a week to meditate, examine what’s going in your life and work on connecting the dots to past experiences to discover the patterns in your life. Then, take the appropriate action that only you can formulate. It’s as simple as that and as hard as that. We are all sparks of the Source/Creator/God, and it is not only possible, but very much within our power to make the changes that will allow us to feel the feelings we came here to feel, and have the experiences we planned for ourselves. We don’t need to create a never-ending maelstrom of the same-old, same-old that wastes our time and attracts preventable drama, pain and suffering into our lives. We can learn what we want to learn closer to the ground floor instead of in the penthouse. THAT is the power of us! Originally from New York State, Sherri Cortland lives in Orlando, Florida with her husband, Ted Dylewski and their many cats. In addition to writing books for Ozark Mountain Publishing, Sherri is also the Orlando Metaphysical Columnist for Examiner.com, where publishes new columns twice weekly, and she also shares messages from her Guides on her Facebook Author Page. And you know what? If we recognize a window after it’s already closed, that’s okay. The first thing to do in this case is to give yourself a congratulatory slap on the back for noticing it! Then look at how you dealt with the situation and figure out NOW what to do differently when the next window opens. And another window will open—you can be sure of that. Learning from an experience and making a plan of action so we’re ready for the next window of opportunity is how we master the skill and how we accelerate our spiritual growth. For information about Sherri’s new book, please visit her website at www.sherricortland.com and click on the link for Guide Group Fridays. Namaste. Dear Readers, THANK YOU for being part of this column with me for the last two years! This will be my last column for a little while as I’m taking a six-month hiatus from writing in order to spend more time meditating and studying. 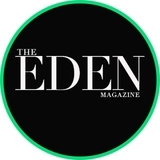 And a huge THANK YOU to my beloved editor, Maryam Morrison, for allowing me to be part of the The Eden Magazine family! Much love, peace, and happiness to you all. know I would emerge into fresh air and new life. And so it was. They were gone. They were all gone, having taught their tender, tough lessons. Was I an unwilling student, a slow learner? Did I grasp the message embedded in my loves’ lifetimes? I hope so, but it was hard learning. Later, still alone, I began to feel that I was being reincarnated in the same body within this lifetime. Although I was certainly aware of the process of reincarnation, I had never heard of this phenomenon, of reincarnation into one’s present body. As the saying goes, “When the student is willing, the teacher appears.” The words of a teacher came to my attention, to elucidate my gleanings and lend credibility to my expanding awareness—a woman no longer living on the earth who had been a respected spiritual teacher during her time here. Eva Broch Pierrakos was her name. She spoke in her teachings and lectures of exactly this concept, in Pathwork Guide Lecture No. 230 (1996 edition). She stated in her lecture, “But there is one phenomenon that I would like to discuss here and that is usually neglected or denied in spiritual teachings: A person who is truly on a path of accelerated development can, and frequently does, literally reincarnate in the same lifetime.” I’d been convinced of this occurrence in my own life, but I’d been reluctant to mention it because of bizarre associations. “Ordinary” reincarnation is sufficiently out of the mainstream that I hesitated to take the concept a single mystical, metaphysical, or esoteric step further. So I was excited to read of Eva Pierrakos and her work. Other writers and researchers in past-life regression have pointed out that a near-death experience (NDE) can be a catalyst for similar transformation within one lifetime. In my own experience, the catalyst was not my own NDE but the vicarious experience of death as I traveled with my children and husband on their journeys. My purpose in writing about intra-life reincarnation, my belief in the Oneness of life and that death is not to be feared, is twofold. First, I’m setting the stage for a later chapter, when I’ll write much more about my new life. Second, I need to emphasize the paradox of recognizing my daughters’ deaths as the acceptable outworking of their lives’ plans, juxtaposed against my huge need for the consolation that could only come and then just partially from moving and memorable memorial services. Writing about funerals thrust me into remembrance of encounters with core truths and experiences of things unseen that occur during the darkest nights of the soul.his is where we enter the place of heart knowing that existed before and beyond the intellect. Soon after I turned forty, and continuing over the next twenty years, I lived through the deaths and funerals of my daughters, my husband, and my parents. Five deaths and five ritualized memorials. My father was eulogized in a small Episcopal chapel in Oregon. My mother’s very simple and private ceremony took place in the front yard of a home where we had lived during my childhood. There were the splendid Episcopal liturgies for my daughters. Finally, there was the elaborately staged community memorial service for my husband held in Town Point Park in Norfolk, normally a venue for festivals and fun. Funerary rites are absolutely necessary for the bereaved, and I think also for the deceased as they transition into the afterlife, their gossamer spirits hovering around their services of final tribute. A Mosaic Heart ISBN 978-0615-51720-9, Quartet Books order from Amazon.com for kindle version print orders, www.terryjones-brady.com A native of Virginia, Terry discovered and nourished her acting talent growing up in California and majoring in dramatic art at UC Berkeley. In pursuit of a career in the theater, she threw herself into acting, dancing and voice instruction in New York with some of the luminaries of the day and went on to many promising roles as she traveled the country performing. A chance engagement with a repertory theater in Virginia brought Terry back to her home state, where she settled into domestic life with the husband and family about whom this book was written. Former teacher of students with learning disabilities, poet, master gardener, certified spiritual director and recipient of the prestigious William Brenner Nonfiction Prize at the Hampton Roads Annual Writers’ Conference in 2010, Terry now lives in the bucolic woods of southeastern Virginia with husband Kevin Brady, their English bulldog, Mia, and Johnnie, a feisty cockatiel. There was an exhibit of funerary urns at the Chrysler Museum of Art in Norfolk, Virginia, during the summer of 2002. The exhibit, Cinerary Urns, featured the works of glass artist William Morris. Exquisitely textured, vibrantly colored, these urns of amazing beauty and spirituality stood empty upon display stands, as the artist’s tribute to personal and collective grief following September 11, 2001. In an introductory piece to the exhibit, Morris wrote: “It is beyond our ideas and thoughts about death that the true mystery and beauty begin.” I agree. The essence of Feng Shui is broad and deep, is complicated and simple. Today I would like to talk about the feedback we have been receiving form many clients attempting to deal with the changing face of how to interact in relationships, business and with the self in 2015.. If the world is in constant change …what are we doing and how can we be in alignment with that constant evolving change? Feng Shui is a universal metaphysic which is involved in all aspects of human and world affairs through the process of alignment relationships. The theme “we are all connected” is at last beginning, fortunately to rise above the surface of our conceptual mindset!!! We experience change at every corner of daily life and yet in order to interface with these changes, are we still functioning from past ideas, knowledge, strategies, ideals or existing emotional states of being? If so we are flogging the preverbal horse to a dead end! In an evolving world we are constantly challenged to evolve with it. A question we are constantly asked is there a process, some way of being where we can still keep our head and emotions above water, and escape the agony of not knowing what to do, or at best cross our fingers and hope all will be good when we finally arrive at some sort of ending. Remember in this universal time frame, traditional methods fail when you are confronted by something you have never dealt with before!!! There are the existing 5 ELEMENTS which everything including us is made up of, EARTH, METAL. WATER. WOOD and FIRE. Then there are the NINE functions of how these 5 ELEMENTS interplay in us and the world at large. As with everything NEW that transforms us in some way…(1) we break through a comfort zone, we burst forth like water and find ourselves reconnecting to people and the world around us. (2) This is where we then pause, ground ourselves with a new sense of foundation understanding. What happens next, (3) we explore, move forward with this new found knowledge of being and play/ experiment with it, knowingly or otherwise. From the experiences gained, (4) we now evaluate the lessons understood and solidly this into added knowledge of our existing knowledge bank. And incorporate this into our daily behaviors, use this to the betterment of our journey-path in all the different facets of our life. This is the TIME of the “GATHERING OF KNOWLEDGE” found, learnt, experienced, solidified, becomes me!!! Next after a period of time (5) we pause once again to discover new ways of how to use this new ground breaking knowledge to further ourselves in this mistaken dualistic world. (6) I envision all the opportunities lay down a path of action before me. I now channel this new knowledge into every area of my life. As it is in life, nothing exists by itself, therefore (7) now I go forth and communicate with the masses, create relationships, find my tribe, build my resources, expand my personal comforts and re-invent my-new-self. Mix with new friends and acquaintances, educate beyond my horizons. This is the time of “THE HUNTER” action. Expansion, risk, discovery, renewal. It may appear to be a never ending cycle, and it is. After a period of time (8) we pause and soak up the experiences, emotions, self-doubts, the sense of discovery, with much delight a new evolved self, yes yes yes,! (9) I am that I am playing in a new found pond of life, no boundaries, life with new breath, I play across the expansiveness which life has always offered, but may have been blind to its parameters. After a period of time when new now moves into usual (1) arrives at our doorstep begging to begin the journey, once again. The ESSENCE of FENG SHUI applies to humans, time, buildings, design, relationships, partnerships, when to move in, groundbreaking, time of marriage, signing contracts, personal assessments, building the right team, who to hire, the list is endless. I would hope that for those of you who are uncertain about the changes occurring around us, it appears every day, find comfort in the words above. Life is the playground to experiment, experience and evolve the self, have fun. Blessings. Everyone talks about consciousness as if it is something difficult to measure. But is it? I started work on defining a metric for measuring human consciousness around 1995. It was an accident really; I was trying to bring together the ideas of Vedic philosophy regarding the higher levels of consciousness and Abraham Maslow’s hierarchy of needs. It struck me that the different graduations of higher levels of consciousness, as expressed in the Vedic tradition, corresponded to the varying degrees of self-actualization expressed by Maslow. From this research came the idea for the Seven Levels of Consciousness Model. Once I had defined the model, I quickly realized that specific values and behaviours could be associated with each level of consciousness, and consequently, if you could ascertain the values of an individual or group you could identify what levels of consciousness they were operating from. The measuring system I developed became known as the Cultural Transformation Tools (CTT). In 1997, I formed a company, the Barrett Values Centre (BVC), and began to use this measuring system to map the consciousness of leaders and organizations all over the world. To date BVC has measured the consciousness of more than 5,000 organizations, 4,000 leaders and 24 nations. In recent years, I began to recognize that in addition to mapping human consciousness, the Seven Levels Model could also be used as a template to describe the stages of human psychological development. Figure 1 shows the stages of psychological development and their correspondence with the seven levels of consciousness. circumstances or a situation that you believe could threaten your internal stability or external equilibrium—anything that brings up fear—you may temporarily shift to one of the three lower levels of consciousness. Alternatively, if you have a “peak” experience—an experience of euphoria, harmony or connectedness of a mystical or spiritual nature— you may temporarily “jump” to a higher level of consciousness. When the threat or peak experience has passed, you will return to the level of consciousness that corresponds to the stage of psychological development you were at before the experience occurred. In rare situations, a peak experience may have a lasting impact, causing you to shift to a higher stage of psychological development and operate from a higher level of consciousness. Similarly a “negative” experience, if it is traumatic enough, and particularly if it occurs in your childhood and teenage years, can impede your future psychological development by causing you to be anchored, through frequent triggering of the traumatic memory, into in one of the three lower levels of consciousness. you quickly learn that the difference you can make is much bigger if you collaborate with others who share a similar purpose or are aligned with your cause. This is where all the work you have done in learning how to manage, master, or release the emotions associated with your subconscious fears pays off. The more easily you are able to connect and empathize with others, the easier it is to collaborate and thereby leverage your impact in the world. Level 7: Service consciousness The seventh level of human consciousness is selfless service to the cause that is the object of your soul purpose. You reach this level when making a difference becomes a way of life. You are now fully imbued with your soul purpose and living the life of a soul-infused personality. You are at ease with uncertainty and embrace whatever comes your way, without judgement. You are always looking for opportunities to grow and develop. • They master their internal cohesion needs by uncovering their soul’s purpose and aligning the beliefs of their ego with the values of their soul. • They master their making a difference needs by actualising their sense of purpose and leveraging their actions, and by collaborating with others who have a similar purpose or are aligned with the same cause. • They master their service needs by leading a life of selfless service for the good of humanity and the planet. Conclusion What the Seven Levels Model enables us to do is make the evolution of consciousness, conscious: If you can measure something, you can manage it. If you want to find out more about the stages of psychological development, the Seven Levels of Consciousness and how the Cultural Transformation Tools are used to measure consciousness of individuals, leaders, organizations and nations please read The Metrics of Human Consciousness. Full spectrum consciousness It is important to recognize that higher is not necessarily better. Ideally, you should learn how to master all levels of consciousness. Individuals who are able to do this are said to be operating from full spectrum consciousness. Richard Barrett, Founder and They display all the positive attributes of the seven Chairman of the levels of personal consciousness: Barrett Values Centre, is an • They master their survival needs by staying internationally healthy, assuring their physiological survival recongnised thought and their financial security and keeping safe leader on values, culfrom harm and injury. ture and leadership in business and society. • They master their relationship needs by He is a Fellow of the World Business Academy, building friendships and family connections Member of the Wisdom Council of the Center that create a sense of emotional belonging for Integral Wisdom, Honorary Board Member based on unconditional love. of the Spirit of Humanity Forum, and Former Values Coordinator at the World Bank. • They master their self-esteem needs by building a sense of pride in themselves and His books include: Evolutionary Coaching their performance and acting responsibly and (2014), The Values-Driven Organization (2013), reliably in everything they do. What My Soul Told Me (2012), Love, Fear and • They master their transformation needs by having the courage to embrace their authentic selves and letting go of the fears that keep them focused on their deficiency needs. The Magic of Owning Your Own Divinity by LEE MILTEER PART ! very single soul on the earth has a king or queen within them who wants to reign over their own life. The word majesty means greatness, bestowing the highest rank of sovereign power or dignity upon someone. Everyone has the ability to let their soul’s greatness shine; it is our natural inheritance. It is your divine inheritance to be a powerful manifestor, and now is the time for you to wake up and claim the true nature of your pow- ers. You have the ability to create and achieve anything you want in life if you are willing to go for it with all your heart and soul and dedicate the appropriate spiritual, mental, emotional, and physical actions to your desires. Our real power in life is 99 percent spiritual and 1 percent physical, yet most people only use 1 percent of their true natural powers. Most people spend 99 percent of their energy trying to change their life or circumstances using only their physical, mental, emotional, or financial energy or power. They deplete their energy trying to do it all themselves instead of tapping into the assistance that is accessible when we ask for it. As the Bible says: “Ask and it will be given to you.” If you ask and then allow yourself to listen to your inner guidance, you will know there is an invisible connection to assist you no matter what challenge you are faced with in the physical world. We all have what I call “spiritual helpers” and we must ask our helpers to assist us to make sure we are using all of our resources and making the best decisions possible. These helpers come to our aid with intuitive suggestions and other people, and information sources that help us solve our challenges, find resources, or be inspired with new ideas we could not have come up with on our own. We’re now living in a world that is shifting to a new level of consciousness which is why spiritual information has become so much more mainstream. Money and success are still super important to us, but we also want to live our lives with integrity, to achieve peace of mind, and to feel that life has a truly deep meaning and that we are contributing to it. We want our work to not only be profitable, but also to be rewarding and satisfying. We long to integrate our spiritual self with all parts of our life, including our business practices. Sadly the majority of people have fallen off their true path in life and have stopped themselves from doing what their heart wants them to do. They allow their culturally programmed logi- cal mind to step in and prevent them from using their own guid- ance and spiritual assistance. Our present reality, our civilization, is dependent on you staying a victim of the past, other people, the media, and fear of the future. You were born with a great internal power to influ- ence the universe around you to manifest the life you deeply want to experience. It is important that you accept your power and release all traces of victimhood. To release the old victim- hood, you must develop an entirely new level of perception of your power to experience love, light, beauty, prosperity, joy, creativity, and grace. Your first job is to awaken to who you really are and accept this new view of yourself to be able to raise your own consciousness. So Who Are You Really? The true essence of who you are is divine energy that has tempo- rarily projected itself into your existing physical body. The real you is the source of your majesty, greatness, and power. As a soul, you are always eternally evolving, expanding, and adding to your repertoire of spiritual tools to help you manifest the life purpose you came to the earth to experience. You have mas- sive creative and manifesting powers built within you to achieve whatever your heart sincerely calls for in your life. All of your power is within you. To claim the ability to bring forth the king and queen within you, it is imperative that you give yourself permission to release your old programming and life, and put them behind you. One of our lessons at this time is to realize our own God- hood, our connectedness with the prime creator and with all that exists. To reclaim the magic, you must realize that every- thing and everyone is connected, and that you are part of it. Your existence matters; you are an important aspect of the big picture of life. Once your mind opens to a new and deeper awareness, you can’t go back to not knowing the truth about Infinite Intel- ligence. You understand that you are more than your physical body and that you’re connected to spirit—to something that is so much more advanced than your human self. When you know this, you also know that you can let go of the drama, self-doubt, fear, and uncertainly about the future. When you’re connected to your source, you have access to resources, knowledge, and assistance that only Infinite Intelligence can provide. The truth is, you are a magnificent being and a member of the family of light. You came to the earth at this time to create a shift, to make a change, to assist in the transition of conscious- ness. Your purpose is to raise consciousness through love so the human race can evolve. We’re at such a crucial time and you are one of the triggers and catalysts to help raise the earth’s conscious- ness to a new place. The true key for you to do that is to under- stand that the universe is made up of love energy. Love is the basic building block. When you have love, all possibilities exist. As the king or queen of your life, your real job is to love yourself enough to get into integrity with your soul’s purpose. When you’re able to live in this capacity you will become an inspiration to all those who encounter you. Light is knowledge and ignorance is darkness, so think of yourself as an ambassador of light—a light worker. There is a consciousness in all things and as a member of the family of light, you can implement and insert new probabilities in the chain of realities, which is how your personal transformation can occur. No matter what situation you may find yourself in right now, it is the power of your thoughts that got you there. You must start to remember who you really are and fully under- stand that you can create your own reality. You must accept that you have the power to alter the frequency of your own life and future. Thought creates, and in that way you have the power to transform your experience. Your frequency affects everyone and every place you go. Your real job is to be a conscious creator. You have to take responsibility for the fact that you are co-creating your own experience on earth. When you take it upon yourself to understand that you are the one creating your reality with your thoughts and beliefs, your entire life will change. Your ability to manifest will truly astonish you. My Beloved Children, “Greetings, My Dear Sweet Beloved Ones, it is with great delight that I share these moments with you. I am excited to share with you that now is a time where you can more easily embrace a greater vision of yourself and for your life. As you look at your life, perhaps there are times in which all you see is what can be considered as travails. Whether there are issues of health, money or relationships, you may feel unrest, disharmony, struggle and suffering. Like thorns in your side, you desire to remove these issues. Please take them away and let them be no more, you say. I am tired of this struggling. I truly desire my life to be easier. Your many prayers, your desires of your heart have been heard My Dear Ones, for the time is now. Within the new energies on Earth, you can easily release from the struggles of the past, while you embrace living in the present moment. This allows the opportunity for you to begin to create a new vision of your life’s journey, to prepare to embrace the idea of stepping into a new beginning of your life’s journey filled with possibilities that will excite your mind and delight your heart. As you may be aware, even more so now, you are living on a world that is changing. This time is filled with the changes your many hearts have called out to be. Take a moment to ponder on this thought. As you do, your heart will witness to you of this truth. to support a new beginning of your life experiences, those with a new flavor of joyfulness and unlimited potentials, you will feel a great sense of excitement. Your passion for life and living will expand as you begin to feel your personal power of choice in action. You will entertain thoughts of what is possible, free of the old stories of limitations and begin to open to the many dreams held in your heart. You are ready to embrace more fully your great value as an evolving being on this blessed Earth. Imagine the possibilities of living all the dreams of your heart! It is your time to shine ever so brightly. You are blessed with the gifts and abilities to move through these times of change into the realms of great and greater joy. There is a treasure of experiences you have been dreamed about, and now preparing to express and experience. Be in joy My Beloveds. Take your steps on your journey, knowing you are lovingly supported. You are always being guided. Listen to the sweet whispers of your heart and allow yourself to receive. As you recognize your personal power within your divine right of choice, know that you and your choices are always honored. You have the power to shift with the winds of change into the New World. A New World filled with opportunities of new beginnings for your life experience. A world of peace and plenty awaits you, where all your life experiences will be free from the past of limiting thoughts. You and all of humanity have been dreaming and preparing for this time. Celebrate this accomplishment for it is the family of humanity which has made this possible. Make choices which bring you joy. Flavoring your life with joy will open up pathways of such a lightness your heart will truly sing. With a new perspective of life, you will become passionate about living each moment. With new excitement and a heart filled with joy, you will move forward, living the grand adventure of your life to the fullest. writing, cooking, or setting up an easel on the beach. There is no wrong path to spiritual fulfillment; simply different paths. But there is a common denominator: “material” things have become “immaterial”, and the “the things of Earth will grow strangely dim…”. 2. Empathy for others: The second sign of spiritual advancement is feeling a greater empathy for animals. Where we once viewed animals as “family pets”, we begin to view them more as simply “family”. We feel a greater empathy and love toward wildlife, and are quick to not only “stop and smell the roses”, but also to water them. We also feel more sympathy and empathy toward people facing hardship, and may have difficulty viewing disasters or wars on the news. This is tightly connected with all the other seven signs because, as we recognize and embrace Oneness and Nature, we begin feeling a deeper sense of sympathy and empathy toward all other souls. 3. Changing diet: Because of this same connection and the spiritual change occurring within our complete being -spiritually, emotionally, and physically -- we often find ourselves changing our diet and decreasing the amount of meat we eat, or abstaining from it completely. Where we once craved sweets or processed foods, we begin to seek natural foods and fresh fruits or vegetables (which may lead to activities such as gardening). Our body may also become less tolerant to man-made medications, and encourage us to seek out homeopathic remedies or healing through natural sources. 4. Becoming less judgmental: The fourth sign is marked by becoming less judgmental. We recognize that all people walk their own path, and even others may be spiritually asleep, and there is no benefit in judging them. Instead of condemning, we strive to spread Light and Love and live as an example. 5. New friends: We also may end old friendships, and merge new ones with people who lift each other up, rather than cutting others down. As our awareness increases, we find it difficult to be around people who submerge themselves in fear and drama. Instead, we seek others who carry the Light. 6. Violent aversions: As our spiritual growth progresses, we find ourselves avoiding violence and loud or chaotic environments that decrease our growth. We may find that TV shows that we once enjoyed (such as the news) or violent movies or video games are no longer palatable to us. We begin to avoid social settings that focus on division, and instead seek environments that encourage unity. Discouraged? Heart-broken? Shocked at someone whom you thought would always be there for you, and seems so alien you hardly recognize them? How do we handle that? When these situations arise, it can be so hard...so challenging to go through. We remember all the Love that was there and wonder (if already aware that we bring to ourselves EVERYTHING) what were we thinking??? And most importantly....What were we FEELING? We must remember foremost before anything else that we did nothing wrong in terms of our thoughts and feelings; we are where we are in our own evolution, and everything is for our grander good. It is all a process, so to speak, and most importantly a grand and glorious opportunity to display and experience who we REALLY ARE, which is a Spirit, having a human experience. And what we wish to BE in relation to it all, is the whole purpose of any relationship, whether platonic or romantic. But we do all understand that there is pain, and how to address this ‘opportunity,’ as it sure doesn’t feel like that when it is going on, does it!? We must first address the feeling from all these negative emotions brought about by what we perceive as someone else’s actions; it ultimately brings about a feeling of LOSS. We feel empty, alone, and sadly; hence, very unloved. Unity seems shattered, as does hope of it ever being better, or that feeling of connection ever restored. What DO we DO? It is more a question of what do we wish to BE about all of it! So many offer encouragement such as it will pass; give it time, and probably the one we fear to hear the most, which is that we just must accept that things changed. How hard it is to hear that or conceive that it will never be the same again? Neale Donald Walsch wrote a wonderful book, ‘When Everything Changes, Change Everything.’ Basically, it is offered that Change is ALWAYS GOOD, no exceptions to this rule. Change is growth; change is evolution, and thus, Change is LIFE. I no longer believe that we must heal from anything, as if one looks closely, VERY CLOSELY at EVERYTHING, there is nothing to heal because we cannot truly ever be damaged. It is all an illusion coming from a perception of how we CHOOSE to view any situation we may find hurtful. to recognize the pain; that usually is all it takes to move away from it. Pivot your emotions during this trial by asking oneself, what one truly desires, and focus on that. (Information from Abraham-Hicks) The transform will and always does eventually occur. Blessings! In his book Corner Office, author Adam Bryant interviewed 700 CEO’s and asked them, “What qualities do you see most often in those who succeed?” Number one on their collective lists--passionate curiosity---is more than a recipe for success. It’s a survival mechanism, because our attachment to life depends on our interest in it, our willingness to cultivate the sense of wonder that Buddhists call beginner’s mind. This mindset views life with the eyes of children, who unabashedly let their tails wag and eagerly sit in the splash zone at the dolphin show, keep all sensors and receptors in the ON position, a runway cleared at all times for incoming adventure and mystery, and who haven’t yet learned the grossly overrated art of being cool and nonchalant, of being the knower rather than the wonderer. It’s easy to get in a rut, easy to stay in the same place, to tread water. We can easily keep ourselves small by doing the very actions that keep us small. It takes a bit of courage, a bit of true lucidity, and a bit of curiosity to take that first positive action that will move us forward. And then, when we keep taking those positive actions, we create a positive momentum – which in turn causes us to look back and wonder what we were waiting for. A friend of mine told me a story about how she would go to dinners with friends each week, complain about how broke she was all the time, how much debt she was in, how difficult that debt made her life, and how she couldn’t seem to get ahead. She told me that she would pay for these weekly dinners with her credit card, and her friends would give her their portion of the bill in cash, or sometimes she would treat her friends to the dinner and pay for the whole thing. This went on for several years, she said, and her debt continued to grow. Money always seemed to elude her, and she lived in a constant state of financial fear. Then, she had a realization, one of those “a-ha” moments that changed things for her. She realized these weekly dinners were part of the problem, not helping her to find a solution. Complaining about stifling debt while creating more debt wasn’t moving her forward, it was keeping her stuck. She knew then what we all must come to grips with at one time or another: you can’t expect something different if you keep doing the same things. Like my friend, I can still remember the fear that huge debt created in my life. I can remember how oppressive debt felt, how much it felt like life was pressing in on me, suffocating me If you have heavy debt – or anything that feels heavy and impossible to solve – then you might be able to relate. It took all of my effort and focus and concentration to take each positive step forward. But each step I took seemed to make the next step a little bit easier.That friend of mine? After she had her realization, she continued to have those weekly dinners with friends, but with a twist. Instead of paying by credit card at a restaurant, she began having potluck dinners at her apartment. Each of her friends would bring a different dish, often around a theme or special occasion, and they had a great time. After a while, she noticed that she had stopped complaining about her finances to her friends. She realized she didn’t need to add to her debt to have a great time. Changing the weekly dinners was the first positive change she made, but it wasn’t the last. It began a process of healing and change that eventually saw her go from mired in debt to debt-free in just a few years. What’s more, that first positive change started a journey of awakening that helped her go from a job that she barely tolerated, to a career that she loves. It helped her to realize that she was able to live a deeper and richer life than she could ever imagine. She became a more positive person, and encouraged others to become financially free. It wasn’t easy at first, but it got easier as time went on. If you can relate to any of this, then you have nothing to lose (and everything to gain) by taking one positive step today. Maybe it means not using a credit card today, or not hanging out with that person who has negative energy, or not procrastinating writing that book. Whatever it means, take at least one positive action today. It doesn’t matter if the action is big or small; any positive action will begin to create positivity in your life. Then, tomorrow, take another positive action. And keep going. Your amazing life is awaiting you. But your amazing life can’t come to fruition if you keep doing the same thing. Today is the day that you can change your life from the same old thing, to a great adventure. I believe in you, and I know that many others do, too. And as you begin to create positive momentum in your life, you’ll start to believe in yourself as well. From the light of god we want you to know that you are entering a very special time and that all events taking place will be in resonance to your highest good and best. We are going to hold your space to give you the full capacity to move forward. You will receive the energy transfer to be become more aligned with your true Self. Simple ask your higher Self to enter your personality here on earth “I call upon my higher self and ask my higher self to merge with my personality here on earth and beyond. Together we walk in complete faith and confidence and know that our prayers will be answered in timely manner.” Even every single time you step into your heart and hold the space; the light will grow stronger and stronger and the inflicted pain you have put upon yourself will fade and will only be a memory of time and remember your personality that this was a lesson for your growth with your higher self merging with you on earth. Allow the past to be the past and free your mind. The NOW is something that becomes more and more the presence, being awakened of what you hold in your true self existence. The now is what you feel when you are connected to your heart - the heart is the alignment to the higher self, that goes straight and directly to God source. Be brave and choose for your Soul´s good to be in the NOW. We ask you with full consciousness and awareness to look at what is going on within your inner world as this may manifest in your outer world as your reality. All upon this, is the courage been given by the Angels with Archangel Michael overlooking and supporting your bravery to choose the path of living more and more in the now! Living with full consciousness and awareness in loving kindness in the NOW can give you such a profound uplift in your beingness that you will ever ask and question why you have dwelled for such a long time in the PAST. Doing in undoing events, happenings and situations when they actually reside already in the past and wasting pure and divine energy to use it for something better you will find when you choose to live in the NOW! The very same applies to those who always wonder what the future will bring. If you give yourself the permission to live in the NOW, the breath of God’s presence will disperse, flaws that have been created by the Ego to immaterialize the essence of feeling once again aligned with your true beingness, your true Self that God has created in its beauty and love to mankind for here and now. This is the existence that will give you all the faith back on your own true beingness and will enter the love and joy of Gods light. It will allow you that your heart becomes once and again the point of light that connects to the light of God and we will rejoin more and more to assist humankind on Earth and beyond. Allowing more light beings serving the Heart of Source of Divinity and coming forward to serve planet Earth. The stream of light of love and Joy will multiply and mother earth is able to sway a sound that has been waiting to unfold, set motion and increase the vibration of any being living on earth. Not only mankind, but also every so beautiful being we call animals, plants, flowers and trees; element of Water, Earth, Air and Ether. If you come closer and connect back to the joy of living in the “Here and Now” we pleasantly will give you the strength and courage to move forward without fear. You only have to call upon and invoke us! We are the messenger of god, waiting for you to move forward without anxiety so that the love of God will infuse you with so much joy that you will embrace each one on your path. With this we are sending you the love we feel for you and your braveness in being here on earth at that particular moment in time we call the NOW. We give you the beautiful affirmation of the Now which you can use at any time you see and feel your mind is creating a flaw that is only the illusion of the Ego. “And herewith, I embrace Gods love for me to live in the HERE and NOW. I have all the faith that will bring God´s love for me and my whole beingness. I am safe at all times. And so it is. Amen! Shamanic healing is fundamentally a beneficial force for growth and change. It deepens awareness of both the causes of problems within one’s life and sheds light on the path forward to a greater well-being and wholeness. Shamanic healing is a means of activating one’s own inner potential and inherit healing abilities. Shamanic Healing is a profound means to self-empowerment and works by: • Unblocking stuck energies in ones auric field, restoring flow, and returning power and energy to their rightful places. Power retrieval to one’s aura restores our personal power, which we may have lost connection to and reconnects us with our power animals and spirit guides. • Soul retrieval returns soul essence; whilst extraction and dispossession _ healing removes and transmutes energies within ones auric space which we have collected along the way that are not ours and belong elsewhere. This way of healing brings profound change, and should only be undertaken only if you are in full agreement of allowing change to happen, to complete the healing. To fully understand the above concept we must take a look at Shamanic cosmetology and the mindset of a Shaman. The Mindset Of A Shaman The Shamanic view of the world is that all things are inter-connected in a web of beingness, everything affects everything else. The Shaman honors’ all kingdoms mineral, plants, animal and human, the four elements earth, air, fire and water, and develops the four aspects of ourselves, physical, emotional, mental and spiritual. With the celebrations of the seasons the shaman attuned themselves to the natural ebb and flow of the Wyrd (fate) the energy of life. The maintenance of one’s personal power is essential to the Shamans well-being. The Shaman must stay centered and balanced this is achieved by remaining rooted in personal connection to the earth, and from this earth connection the Shaman is then able to reach into the spirit realms. In this way, the Shaman becomes a channel between the energies of the earth, nature and the energies of the spirit world. In engaging in the Shamanic practice the Shaman must move between what is termed the ordinary state of consciousness and the Shamanic state of consciousness. It is in this Shamanic state of consciousness that the Shaman contacts ones power animal, spirit guides and helpers. we can see with the eyes of the mind and the heart and can begin to explore, and experience our own subtle energy field or Aura and see into the world of the Shaman. When C.G. Jung, the psychiatrist and mythologist, visited the Pueblo Indians, he wrote of ‘discovering new approaches to age-old knowledge that has been almost forgotten’. In his conversations with Ochwiay Biano (Mountain Lake), he encountered the ‘Red Man’ who spoke from the heart, who spoke with what the American Indians called ‘Perfect Speaking’. ‘See how cruel the whites look,’ said Ochwiay Biano. ‘They are always seeking something... We think that they are mad’ Jung asked him why he thought the whites were all mad. ‘They think with their heads,’ he replied. ‘Why of course. What do you think with?’ Jung asked him in surprise. ‘We think here,’ he said indicating his heart. The Way Of The Wyrd As mentioned before we are all connected in a sea of energy “the Wyrd”(fate), a sea of universal potentiality it contains everything that ever was and everything that shall ever be. How we interact with this sea of energy depends upon our individual perceptions of it and this then becomes our own individualized perception of reality life as we know it. As we become more proficient in our spiritual development from a shamanistic perspective we realize that we are multidimensional beings having a mind, a body, and spirit. The Universe and all that’s in it is in a constant state of expansion, creation and evolution because that’s the nature of all things. Whether we like it on not we are all on a personal adventure like a hero in a film we set off on a quest to discover our true nature. However, to find our life’s purpose the universe will only share its secrets to the worthy, so we are tested all the way so that we can master the lessons that the Universe gives us. The universe shows us the heart of our soul so that we may become the heroes that we are meant to be and to live the life, we were bone to have. gy bodies, which come into play when we reach certain levels of spiritual awareness. Through the Shamanic Healing process, we begin to: • Disassociate with energies that are not our own. • Not to take life so seriously, • To be more playful in our lives • To pay more attention to our own inner wisdom. We learn: • Where thoughts go Energy flows. • To be playful with our imagination • The unconscious mind communicates through analogies, symbols, and metaphors. Ironically the only thing that separates us from consciously understanding this Shamanic state of consciousness and the world of spirit and energy is our perceptions of it. For if the essence of who we are is a holographic pinprick of the Creator, which is internal, then surely that must mean we are in fact an individualized expression of that source. When we realign our lives through the Shamanic Healing process we get inspired or in spirit. We instinctively find that hero within and live our life automatically on purpose, acknowledging our own inner wisdom and the spirit that moves in all things. Needs your help, many beautiful animals waiting for a loving home.